…Okay, sorry. Totally rambling here…. onto the point…. So, I’m talking about the four little brown guys that surround the biggin. Whenever someone new comes over to visit, I get comments and/or compliments on them, so I thought I’d toss it onto the ole’ bloggy blog. This art is so easy that I actually feel guilty getting compliments. Is that weird? Not really. Well, sorta. This art seriously cost me around 12 buckaroos. For all four pieces. 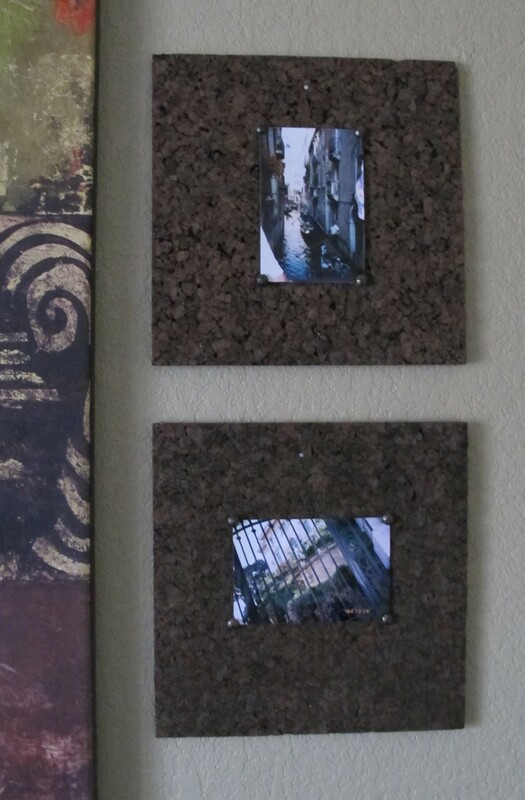 They’re simply dark brown, chunky cork panels, which I found a while back at Hobby Lobby. They came in a pack of four for around 12 dollars (and no, they weren’t 50% off at the time… these were purchased during my Decorating Dark Ages, when I was ignorant of the inner sale workings of such establishments. Shame, really.). But, if you wanted to camouflage them, all it would take is a dab with a brown marker. 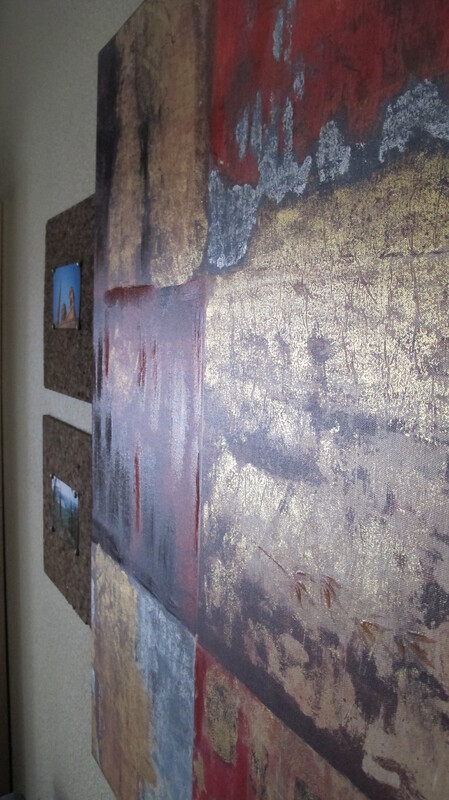 I love the texture and simplicity of these pieces. Kind of rustic, but with clean lines. Totally my jam. This art set is one of the few decor items that’s remained intact (without a makeover of any kind) as my taste has evolved over the years. It’s a little unique but simple enough to fit in with many styles. 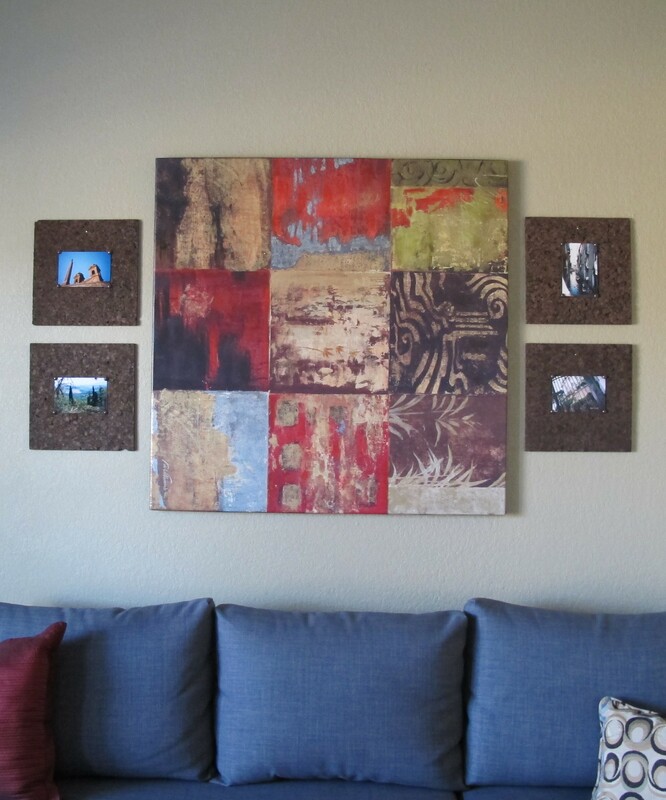 Sort of a different take on picture frames. Also, I’ve been ecstatic about how well they’ve held up over the years. They’ve adorned the walls of two apartments, our last house and our current house and they don’t seem the worse for wear in the slightest. Definitely worth the moolah. 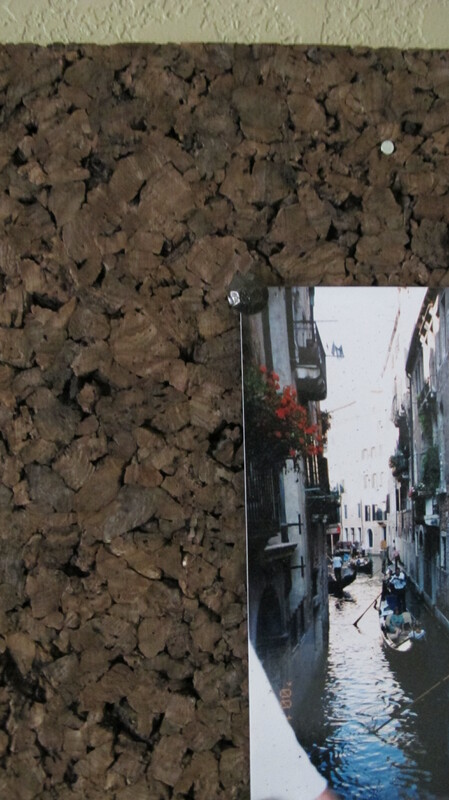 Also, cork tiles are really versatile. Just about any art would work on them. More colorful, fun prints for a kids room. You could even paint initials or emblems onto them or cut out some cool letters or shapes in cardstock or scrapbook paper and adhere them to the center of the tile. In our last house, I purchased a second, more standard-looking set of cork tiles for our office and simply stuck a clear push-pin smack-dab into the center of each tile on which I hung our extra cds (shiny-side-out). It was functional CD storage and art at the same time. Storage in plain sight. 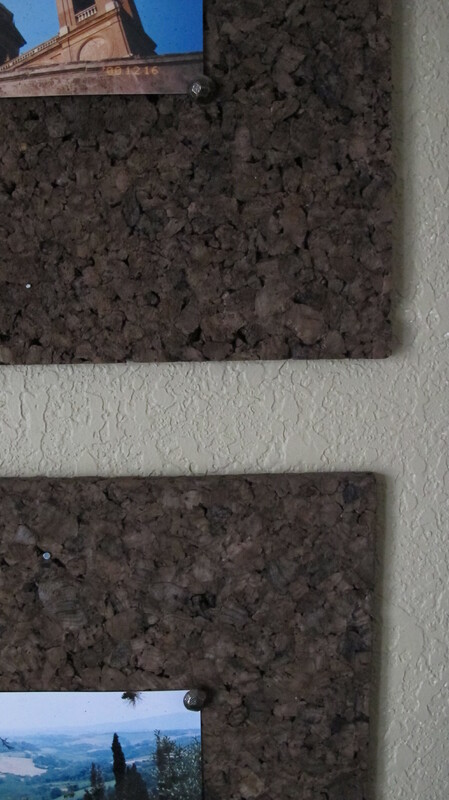 So, these cork tiles are gold, really. So many cool things can be done with them. 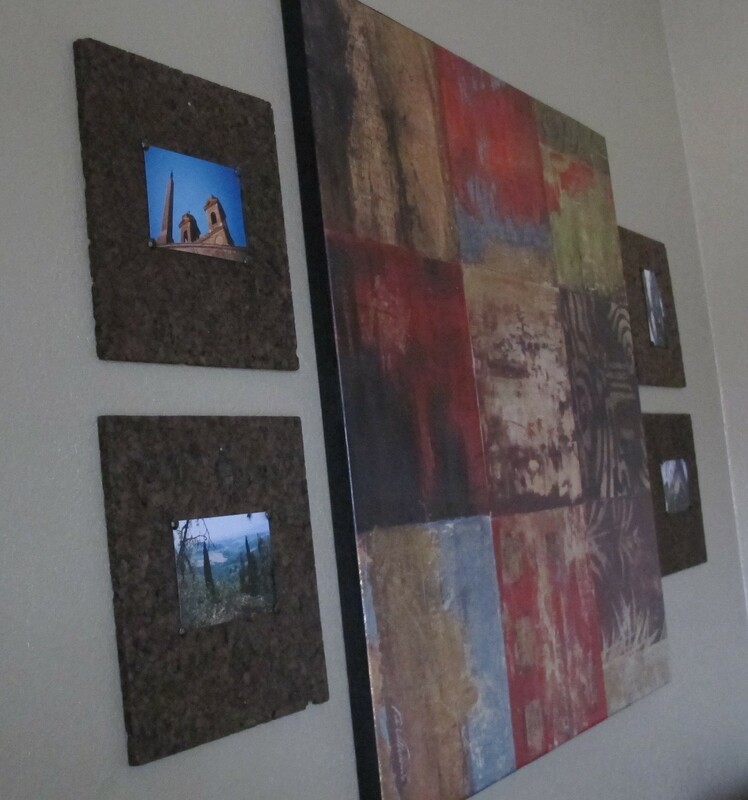 Have any of ya’ll utilized cork tiles in a different way? Any ideas to share? C- you never cease to amaze me. I love your creative ideas! Nice work.